Knowledge of environmental issues and sustainability is increasingly important as industrialization and climate change continue to wreak havoc on our ecosystems and our psyche. As temperatures rise — and icecaps shrink and storms lash our coastal areas into oblivion — being smart about carbon footprints, waste streams and consumer choices becomes increasingly important for all of us. That’s where EarthTalk comes in. Our mission is to help everyday people like you and me understand complex environmental issues, promote sustainability and live greener lives. We do this by producing and distributing our weekly EarthTalk Q&A column, syndicated to 600+ media outlets across North America with a combined readership in the tens of millions. We pick the most relevant and timely questions received from readers and fans, and then respond with 500-word answers that are distributed to our syndication partners for publication in their newspapers, magazines and websites. The bulk of our syndication partners are small-town weekly newspapers, but other niche publications and larger media outlets such as the Christian Science Monitor, MSNBC and SciAm.com (Scientific American’s website) also publish our column regularly. This syndication network provides hundreds of small, budget-impaired news organizations across the U.S. and Canada with a way to provide content on the environment and sustainability for their readers. Given our reach way “beyond the choir” of the environmental community we can use the column to get information out to everyday people about environmental topics relevant to their health, well-being and happiness. And when those readers’ interest is piqued and they have more questions about sustainability and green living, they know where to turn, providing us with a virtuous circle of questions and answers. Meanwhile, we are reaching new audiences online. 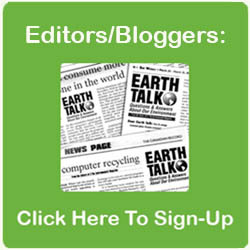 Our EarthTalk.org website, launched in January 2015, serves as the online home of the column and as a platform for the distribution of additional original content on related topics from a diverse array of contributors from around the world — and as the hub of our social media universe. We are also venturing into radio later this year with the launch of a series of weekly two-minute audio versions of some of our written Q&As to serve as inserts between radio stations’ other programming. And we have also begun work shaping the Q&A format to match the needs of middle school teachers hungry for curriculum aids that engender critical thinking and discussion among students about subjects near and dear to them, the health of the planet and its inhabitants. We hope to roll out our free, downloadable “EarthTalk in the Classroom” classroom kits by the Fall of 2015.